When manufacturing plastic products that will contain or come in contact with food or beverages. It is strongly advised that the type of plastic material used is investigated to ensure that it is safe for use. In order to ensure the safety of the plastic product to the end consumer. It should be noted that certain types of plastic are used to fulfill certain roles and applications. The types of plastic have different characteristics which allows them to be suitable for certain products. Whereas as some types of plastic it is highly advised to not be used for some products. For instance one type of plastic used to produce water bottles, will not be suitable to contain dairy products or hot food. Certain types of plastic may also be affected by heat that can be hazardous.Read below for more. 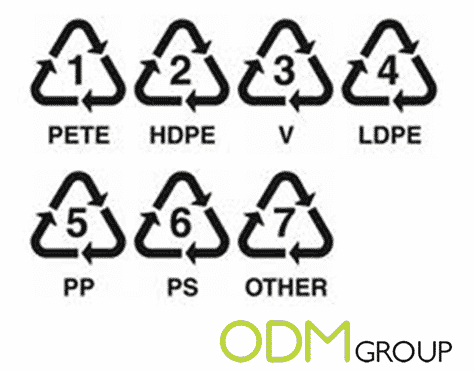 Manufacturers use common international symbols to indicate the type of plastic materials used within certain products. It is located on the bottom as a graphic symbol consisting of three arrows forming a triangle. In the middle of the triangle there is a number from 1 to 7. This type of plastic is mainly used for manufacturing beverage containers. PET is used to make bottles of mineral water, soft drinks, ketchup, peanut butter jars, etc. Such items are commonly recycled. HDPE (high density) is used for the production of semi-rigid containers. It is one of the safest plastics which can be reused. Polyvinyl chloride is present within construction and decoration materials, furniture, shoes, medical products, water bottles, food packaging film. PVC is dangerous to health and can release toxins. Low density polyethylene plastic material is present within products such as bottles for detergents, toys and pipes. Polypropylene can be used multiple times and is common as a material for food containers or Tupperware . It belongs to the most safe plastics material along with HDPE. It is not commonly recycled, but can be used in many areas. It is strong and is resistant to high temperatures, but this type of plastic cannot be transparent. This type of plastic, Polypropylene is present within medical products, equipment for hot meal and food packaging film. Polystyrene is also well-known as a foam. Is widely used to cushion packages. Polystyrene releases toxins and should not be used as food packaging. These other types of plastic should never be re-used. Including Baby bottles, microwave oven ware and eating utensils. This type of plastic includes many types of harmful chemicals. That can cause injury or death if ingested. This material is tough, strong and chemical resistant. It is clear and transparent. This type of plastic is used in manufacturing plastic dishes, credit cards, blister packaging, rapid deployment flood walls, and bags. 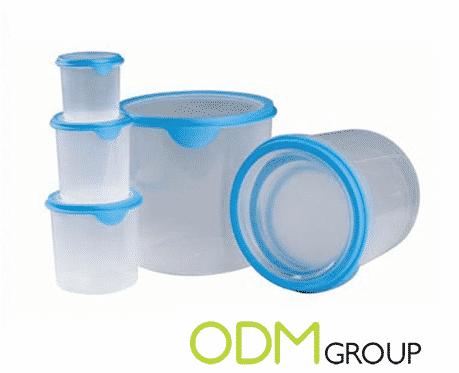 So what types of plastic are suitable for production of plastic cups and containers? Plastic cups and containers can be successfully made of PC, PET or PCTG material. But these plastics will have different characteristics and as a result will be suitable for different functions. One of the most important requirements in producing such items .Is the question whether the plastic product is dishwasher safe. Heating certain types of plastic can be inadvisable due to the effect upon the chemical structure. This can cause the plastic product to deform or melt when heated. When heating any type of plastic in the microwave or dishwasher it is strongly advised to check that the type of plastic is safe for these appliances. Before manufacturing of your plastic dishes start. It should be noted that PET will melt at temperatures higher than 70C (the upper limit for dishwasher water). PC is heat resistant. However it releases BPAs, which makes it acceptable only for hand washing. PCTG material can withstand various chemicals and cleaning agents as well as high temperatures. It does not contain BPAs, which makes it the most suitable option. At ODM we advise that PCTG is used. It is heat safe or in this case dishwasher safe. As it can be hazardous to put certain types of plastic products into this appliance. Manufacturers also strongly recommend that PCTG plastic is used as it is the most safest material and will not cause harm or injury to the user.